Charlottesville violence is only the latest expression of America’s spiritual crisis. A sociological analysis of the problem and a suggested solution. I am naturally appalled, frightened and disgusted by the presence and violence of Neo Nazis in Charlottesville Va. I also wish America had a President with a level of political, leadership abilities who could more effectively unite a majority of Americans around a highly needed conservative social agenda, despite the media. However, if our simplistic conclusion from the events in Charlottesville is simply to forthrightly and correctly condemn Neo Nazi violence, we will be failing in our understanding of what is truly happening in America’s political society today. 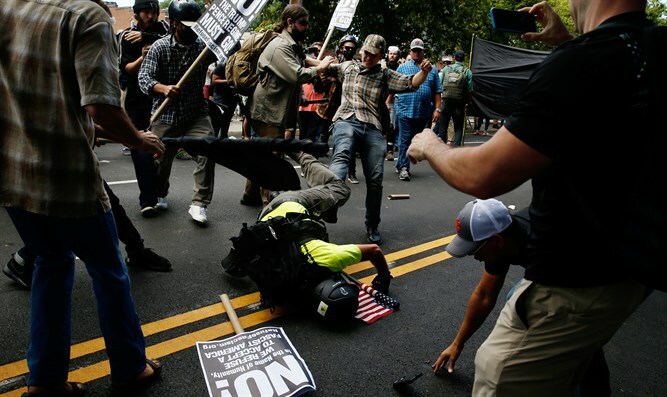 In a deeper sense, the violence in Charlottesville is the result of the fact that both the militant nationalistic Right , and the militant (politically correct, hence forth entitled ‘pc’) liberal Left are both dangerously weakening the societal structure necessary for maintaining America’s 200 year liberal democracy. Liberal democracy, (conservatively understood), can only survive if a majority of Americans ascribe to a common set of patriotic ideals and institutions. The militant Left and militant Right both reject organizing Americans around an idealistic, patriotic political agenda. Instead, both the Right and Left want to politically organize around agendas of “self identities of oppression”. Both the Right and Left are encouraging various American sub groups –blacks, sexual gender militants, working class white males, religious fundamentalists- to militantly organize around a common sense that their sense of self identity is being rejected and trampled upon (by the very rapid social changes of post modern society) , and that they have to militantly act to force America to more successfully answer their social needs as defined by their subjective sense of self identity. This political organizing and consciousness raising based on subjective, self identity perceptions of oppression by surrounding society I define (in this article) as the politics of ‘the self identity of oppression’. The Right is organizing working class, white males and religious fundamentalists, and the Left is organizing gender and racial minority groups around this post modern political ideology of “the self identity of oppression”. Writing from a conservative perspective, I am convinced that this political ideology of ‘the self identity of oppression’ is seriously endangering the existence of Americas’s liberal democracy. My pc liberal friends will be horrified that I am equating the ‘self identity, subjective sense of oppression’ needs of blacks and sexual gender militants with those of working class white males and religious fundamentalist. Pc liberals ‘religiously’ believe that the first two sub groups deserve the coveted title of ‘the oppressed’, and that the last two groups deserve to be labeled ‘the oppressors’. But that’s my point. In post modern society, every sub group can legitimately organize around its particular, subjective ‘self identity sense of oppression’. Any sub group can play the game. Every sub group can resent, attack and blame another sub group for oppressing them, and there is no objective way to determine whose subjective sense of self identity oppression is more legitimate that the other. (The academia of the post modern world teaches that there is no objective, rational gold standard for determining social justice. There are only the subjective narratives of various sub groups claiming oppression). For example, the pc liberal narrative of the last twenty years has blamed many of America’s failings on the oppression of various sub groups by ‘old, white males’. It thus should come as no surprise that that after twenty years of suffering, sustained ideological attack in academia and in the media, these ‘old/young white males’ will politically organize to rectify their subjective ‘ self identity sense of oppression’. Thus one way to understand the violence in Charlottesville is to see it as the violence of certain ‘white males’ acting to defend a “self identity sense of oppression”. This political ideology of organizing competing sub groups around a subjective, self identity sense of oppression is obviously leading the American polity down the road of self destruction. Leo Strauss, the great, conservative political philosopher of the twentieth century, teaches us two basic facts about liberal democracy (conservatively understood). In this Strauss continues the 19th century political philosophical analysis of democracy by Alexis De Tocqueville. One, liberal democracy is the political regime most conducive to the social welfare and well being of modern man. The most obvious proof is the tremendous 250 year success of the American Constitution and America’s liberal democratic regime. It has been much more successful and long lasting in sustaining modern man’s social welfare than competing socialist, communist, fascist and Islamic theocratic regimes. The tremendous, current interest in immigrating to America is the best proof of America’s success. Second, a liberal democracy is a political regime that is hard to construct and sustain, and easily destroyed. The radical/revolutionary Left and Right are always ready and eager to tear it down. Strauss experienced this first hand in German Weimer Republic. 4) so as to maximize the citizen’s materialistic sense of personal security and well being. Liberal democracies are vulnerable because of the internal contradictions amongst these principles. One, every citizen is encouraged to use is ‘’freedom ‘ and ‘equality of opportunity’ to pursue his self interest as he sees fit, but the self interest of one citizen will often contradict the self interest and opportunities of the other. Two, given its emphasis on the individual freedom to pursue one’s self defined personal self interest, a liberal democracy lacks a transcendent, overriding set of ideological-spiritual beliefs around which to unite and mutually obligate its citizens. A liberal democracy will thus provide material security and well being at the price of many citizens’s feeling socially atomized, vulnerable and isolated. 4) multi-generational, extended family life. These four social institutions will bind together in solidarity the otherwise atomized individual citizens each concentrating on maximizing his self interest. Without the strength of these four social institutions, liberal democracies will not be able to sustain themselves. Leo Strauss’s and De Toqueville’s above political analysis of liberal democracy’s virtues and contradictions should be the basis for a socially conservative political agenda. This agenda should maximize the ability of all citizens, including all ethnic and gender minority groups , to actualize the freedoms and equal opportunities to better themselves that liberal democracy provides. Side by side, the government should respect and promote the patriotic nationalism religious life, communal and extended family life that will provide the bonds of solidarity and civic obligation that is necessary for maintaining the social infrastructure of a liberal democracy. Abraham Lincoln, in his plans for post civil war reconciliation, forgave the previous deeds of rebellious (even ‘traitorous’) slave owners, insisted that they not be punished or denied their civil and property rights, and simply insisted that they civilly accept emancipated slaves, and restore their allegiance to the constitutional principles of the founding Fathers. Abraham Lincoln read De Tocquevile and understood what political principles and social institutions are necessary for maintaining the historical ‘miracle’ (that is how Lincoln understood America’s greatness) of America’s liberal democracy. I thank the reader for his patience for our digression into political philosophy. But only by understanding the relatively fragile, vulnerable nature of America’s liberal democracy can we get beyond the editorials, the headlines, and Trump’s political statesmanship. Given the above analysis, it seems necessary that both the militant Left and the militant Right must stop organizing minority groups around the discontents associated with a ‘self identity sense of oppression’. The American Center must promote bonds of national solidarity and civic obligation by responsibly strengthening the social institutions of patriotic nationalism, religion, and communal and extended family. It should work to alleviate the economic discrepancies and lack of equal opportunities amongst all minority groups. The historical institution of slaveholding, and the historical exploitation of Native Americans should be recorded and taught, but in the context of the historical fact that America is humanity’s longest, most stable and most successful liberal democracy. The proof of this last statement is that peoples from all over the world want to immigrate to America.